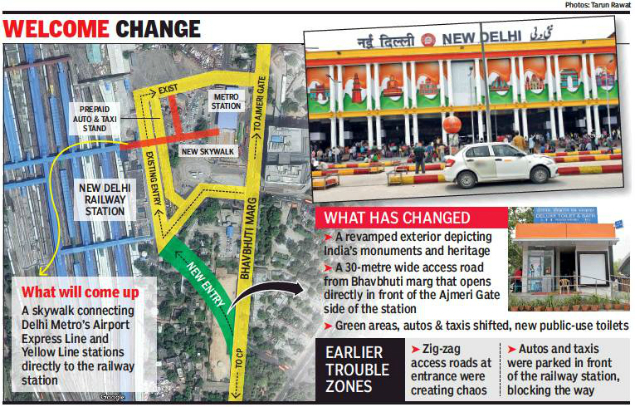 NEW DELHI: The Ajmeri Gate side of New Delhi Railway Station has undergone a complete makeover and looks set to become the preferred of the two entrances for travellers. There is a new 30-metre access road now and other changes, including separate parking zones for autorickshaws and taxis, aesthetic green areas and a colourful façade portraying the country’s heritage. While the deadline to open the access road was September 2018, officials told TOI that shifting several buildings took longer than expected. The space through which the road passed had sub-stations, railway staff quarters and the office of the deputy commissioner of police. To shift these, Northern Railways had to exchange real estate with Delhi Metro. Singh said that the old lanes in front of the station were always crowded with taxis and autos, but they have now been provided their own passages beyond the fourth lane and separate parking areas as well. More than four lakh passengers pass through the station every day. The Ajmeri Gate entrance handles 65% of this passenger burden, officials said. To further improve access for commuters, a skywalk will start functioning in the area in the next six months and it will connect the Delhi Metro Airport Express Line and the Yellow Line metro stations with the central footbridge of the railway station. “The entire circulating area has been remodelled and state-of-the art LED signage will gradually be put up. The skywalk to improve access for pedestrians is likely to be completed within the next six months and this should further reduce the traffic on the ground,” said Singh. A new blue-orange colour scheme has already been introduced in New Delhi Railway Station inside, while Madhubani and wall paintings were included last year to improve the interior aesthetics. A new false ceiling was also added recently at Platform 1 as part of the long-term plan to improve the railway station.